"Just as the film industry has the Oscars for the majors and Sundance for the independents, now the e-publishing industry has the first Independent e-Book Awards." To avoid self-published authors and smaller presses, IEBAF accepted submissions only from publishers that have published the work of 20 or more separate authors (in any format) during the current award year. Unlike Frankfurt, the new Independent e-Book Awards is only open to independently published electronic books and includes categories for both hypertext and digital storytelling. Books must have been first published as an original electronic book. Unlike Frankfurt, all judges involved with the new awards are part of the electronic book community. * Microsoft*in the last year edition of the *Frankfurt Book Fair* announced its founding sponsorship of the Frankfurt eBook Awards. "The awards are intended to recognize both literary and technological excellence in electronic publishing and boost the supply of high-quality electronic books available to the public." Announcement followed several other initiatives by Microsoft (*ClearType font technology*, *Microsoft Reader*, and support for the *Open eBook standard*). 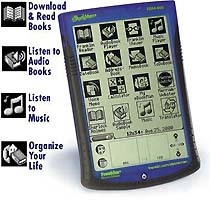 Electronic book (e-book) can be downloaded to a personal computer or to a hand-held reading device, or they can be printed "on demand." Concept of e-books has shifted. "Last year at this time, e-books meant proprietary hardware devices. Over the past year, it has evolved to mean the consumption of electronic content from many devices." (Joe Eschbach, vice president of Adobe's ePaper Solutions Group). Different people define e-book differently. For some, an eBook is the content you read (a "paperless" digital version of a book, article or other document). *The Open eBook Specification* defines this as the OEB Publication. For others, an eBook is what you read on, such as a personal computer, either desktop or portable (running Acrobat Reader from Adobe Systems or Microsoft Reader from Microsoft), a palm size computer (running Peanut Press Reader from Peanut Press, Aportis Doc from Aportis Technologies, or TealDoc, from TealPoint Software), or a dedicated eBook reader (SoftBook from SoftBook Press, Rocket eBook from NuvoMedia, EB Dedicated Reader from EveryBook, Librius Millennium E-Reader, eBookMan from Franklin Electronic Publishers, Korea eBook, Cybook, goReader...) designed for viewing and reading electronic books. The Open eBook Specification defines this as the Reading Device. * Selection & Availability: new titles -- plus those that are backlisted or out-of-print -- are immediately available. * Easily Searchable: find specific terms, definitions, and other reference material. * Customized Viewing Experience: modify screen contrast, font size and style for the most pleasant reading experience. * Weight and Size: carry a vast amount of reading material in a small package. Adding a book doesn't mean adding weight to your briefcase or backpack. Top professionals in the industry to judge fiction, non-fiction, hypertext and digital storytelling. The eBookMan from Franklin Electronic Publishers that was the eBook Technology Award in Frankfurt.